40+ quick-fixes are available to instantly solve many of the detected code issues. Whenever you see a light bulb to the left of your code, press Alt+Enter to apply a suggested quick-fix. For example, when an uninitialized variable is detected, you can immediately initialize it with the default value. Other quick-fixes let you add missing #include directives, or remove redundant qualifiers in a particular statement, or in a larger scope such as a file or even the entire solution. Another benefit of quick-fixes is that you can start using classes, methods, variables, properties and fields before you declare them. When ReSharper C++ detects an undeclared symbol, it suggests quick-fixes to generate the corresponding symbol declaration based on its usage. 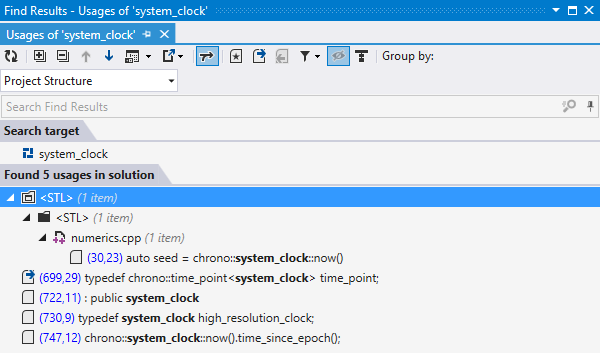 For any given scope such as a file, project or solution, you can tell ReSharper C++ to display all code issues that it detects in a dedicated tool window. 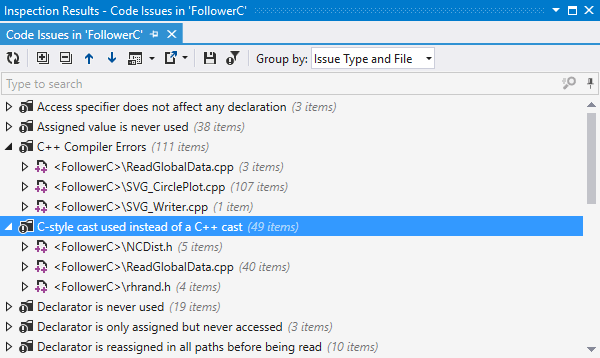 Find Code Issues works in the background, which lets you keep editing or navigating your code while ReSharper C++ runs its analysis and populates the Inspection Results tool window. As soon as results are ready, you can group them by various criteria and search to find specific types of issues. You can also save and load reports of Find Code Issues results. 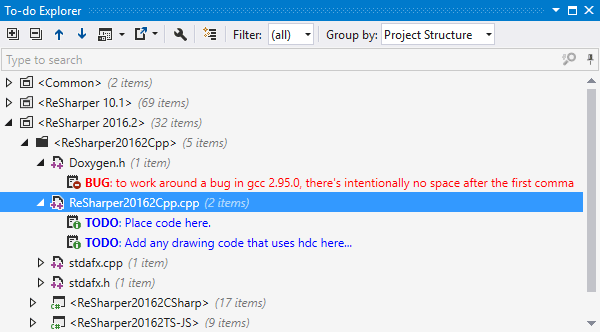 ReSharper C++ code inspections are also available via InspectCode, a free command line tool that allows running ReSharper inspections outside of Visual Studio. To use InspectCode, please download and unzip the command line tools package and run InspectCode.exe with your solution file as a parameter. To learn more about using InspectCode, please read this article. ReSharper C++ provides several full-scale, mainstream refactorings such as Rename, Extract Method and Change Signature. In addition, it offers dozens of context actions, which are local code transformations available with a single shortcut. Modifying the name of a class or macro can cause many problems when performed manually. 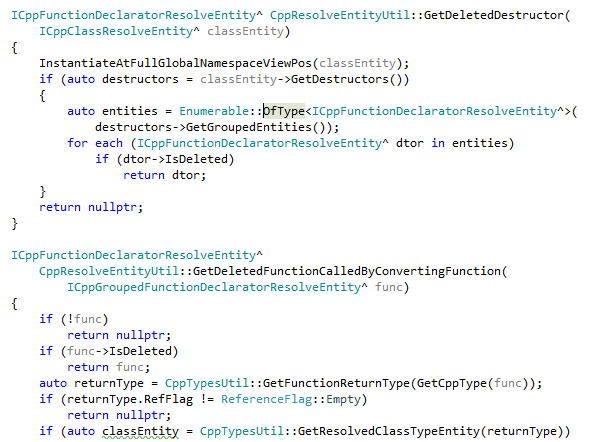 That's why, when you invoke the Rename refactoring, ReSharper C++ takes care of all the necessary checks. Either all modifications are performed automatically, or you're shown a list of conflicts that you can resolve manually to be sure that only necessary and appropriate changes are made. 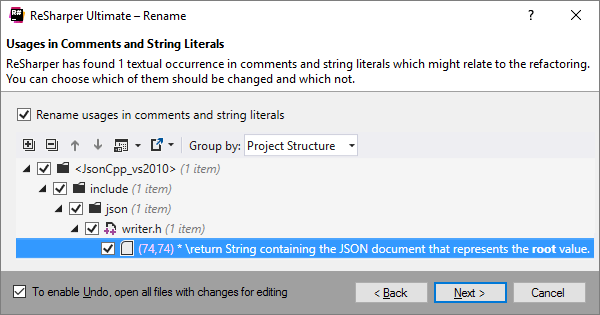 Along with actual code symbols that you apply it to, the Rename refactoring can rename related files (both the source file and the header file) and related text in comments and documentation, as well as update usages in #include directives. The Extract Method refactoring helps you create a new method based on a selected code fragment. 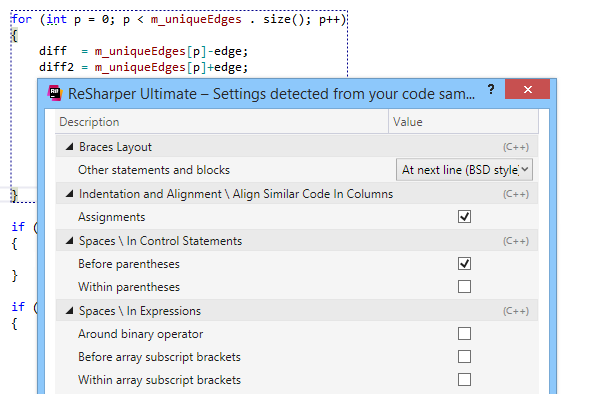 ReSharper analyses the selected block of code and detects variables that can be converted into method parameters or represent its return value. The Change Signature refactoring allows you to apply one or more changes to the signature of a function. All usages, implementations, and overrides of the function will be updated accordingly. The Introduce Variable refactoring allows you to create a new local variable based on a selected expression, initialize it with the expression, and finally replace all occurrences of the expression in the code with references to the newly introduced variable. Conversely, Inline Variable replaces all occurrences of a given variable or local constant with its initializer. The Introduce Field refactoring helps create a new field based on a selected expression, assign the original expression to the field in its own initializer or in the constructor, and replace occurrences. The Introduce Namespace Alias refactoring helps define shortcut names for deeply nested namespaces. As soon as you invoke the refactoring, it suggests defining a scope that you want to introduce a namespace alias for. The Introduce typedef refactoring allows you to quickly create a typedef for the selected data type and replace this data type and all its occurrences with the newly created typedef. The Inline typedef refactoring does the inverse: it replaces an existing typedef with the actual data type. In addition to refactorings, ReSharper C++ provides a set of context actions: local code transformations that usually help switch between alternative syntax options. Similar to quick-fixes, they are made available when you press Alt+Enter. For example, you can quickly replace auto with explicit type or replace type with auto. Other context actions help merge nested if statements, generate missing case statements when switching over an enum, substitute a macro call or typedef etc. ReSharper C++ extends Visual Studio's ways of highlighting syntax and matching structural pieces of code, provides its own implementation of code completion, and helps visualize available documentation for any C++ symbol. ReSharper C++ recognizes *.c, *.cc, *.cxx, *.cpp, *.h, and *.hpp files in your solution, and highlights source code in these files according to a color scheme that you can modify at any time. In addition, ReSharper C++ highlights various matching items when you place the caret at one item in a pair, be it matching delimiters, macros or a format specifier and argument in a printf function call. When you put the caret on one of exit points from a function, loop or a switch statement (return, throw, break etc. ), ReSharper C++ will now automatically highlight all other function or loop exits. In C++ files, you can use code completion when writing your code, which sometimes suggests code generation options among other choices. Code completion can even suggest symbols that are not yet included in the current file. When you select a symbol like this in the completion list, the corresponding #include directive is added automatically. Quick Documentation pop-up displays documentation based on Doxygen comment blocks without forcing you to navigate to a symbol's definition: just hit Ctrl+Shift+F1 in the default keymap. Even if there is no Doxygen documentation available for a symbol, Quick Documentation will show the symbol's signature. 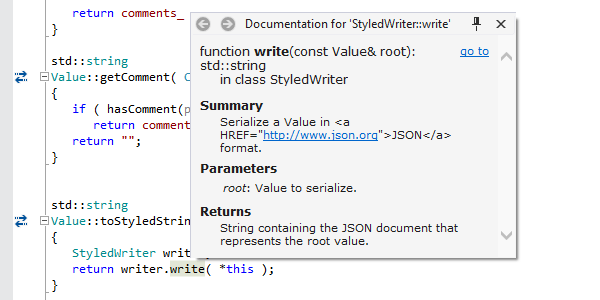 ReSharper C++ can also display rich, syntax highlighted tooltips for C++ code elements. The tooltips will display function and variable types, as well as documentation. C#-style XML documentation comments are also sometimes used for C++ symbols. 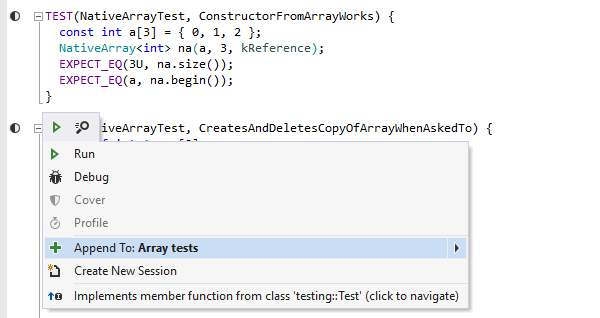 ReSharper C++ correctly displays them in the Quick Documentation pop-up and in the quick info tooltip. Within C++/CLI code you can access all the same refactorings and intention actions as in pure C++ code. There is also an ability to navigate between C# and C++/CLI worlds. 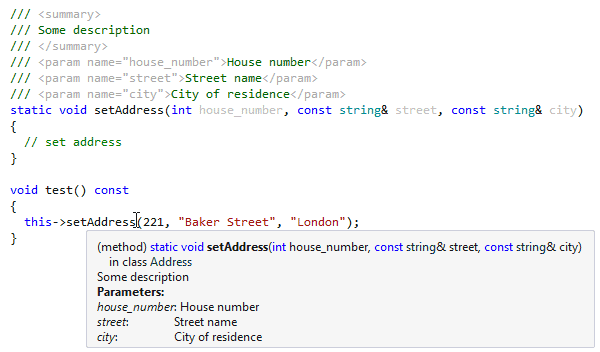 With ReSharper C++, finding your way through the source code gets a lot easier. Just search for declarations, members, method calls, or members of an inheritance hierarchy with simple shortcuts. For all symbols that have separate declarations and definitions, ReSharper C++ displays the Navigate to declaration/definition icon on the left ( ). Click the icon or press Ctrl+B to quickly switch between the declaration and the corresponding definition. ReSharper C++ offers a set of context-insensitive navigation commands including Go to File, Go to Symbol, Go to File Member and Go to Everything. All these commands support lowerCamelCase-based search and filtering by path. 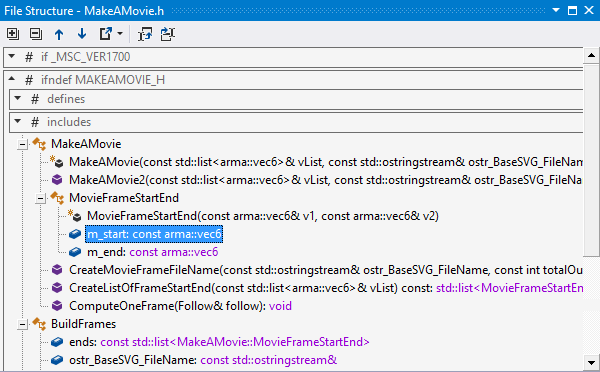 For example, entering fc movie in the Go to Everything pop-up returns the list of files and file members that have the string movie in their names and that belong to either FollowerC project or FollowerConstants namespace (both matching fc). 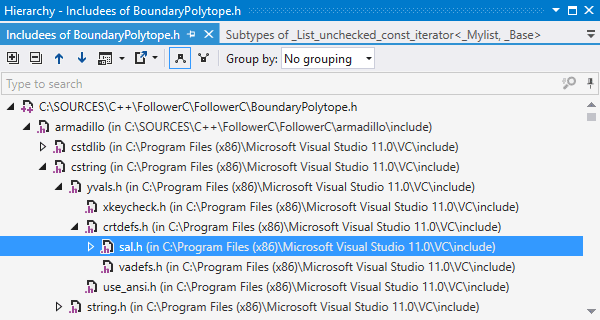 ReSharper C++ can give you an overview of the inheritance hierarchy that any given type is a part of. You can see both base types and inheritors of the selected type and navigate to any of them in one click. In addition, ReSharper C++ comes with a hierarchy view that serves to visualize and help you figure out dependencies introduced via #include directives. Use Find Usages to search for all references of a specific symbol in the C++ code of your solution. As soon as search is completed, found occurrences are displayed in a tool window with grouping and filtering options, as well as a preview pane. With ReSharper C++, you can view the structure of the current document using the File Structure window, which greatly simplifies navigation in large files. As you switch to another editor tab, the tool window displays the structure of the corresponding file. The To-do Explorer tool window lets you view, group and filter comments that contain one of the 3 default to-do patterns (Bug, Todo and Not Implemented) and any custom patterns that you might want to set up. ReSharper C++ provides a variety of ways to generate boilerplate code. In addition to declaring and defining symbols based on their existing usages, it can create type members, surrounding code blocks, and any code snippets that you commonly need in your code base. 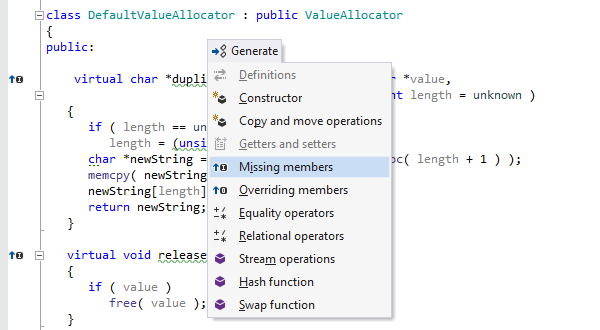 ReSharper C++ offers a quick way to generate missing members, overriding members, equality or relational operators, definitions based on existing declarations, hash and swap functions and constructors. Just press Alt+Ins in the text editor to invoke the Generate menu and see all available options. ReSharper C++ comes with 29 customizable templates. Some of them are regular code snippets, others are specifically used to wrap around code selections. You can use and create file templates as well. Pressing Ctrl+Alt+Ins helps you quickly add a class to the project you're working on. With ReSharper C++, code formatter learns from your existing code, and your formatting and code style preferences can be shared with your team members. ReSharper C++ allows you to configure and apply code formatting rules that you prefer to use when working on a specific solution. As an alternative to digging through all available code formatting options, you can select a block of code and configure only those that are applicable to this particular block. To ensure a consistent code style across the entire team, you can save your formatting and naming preferences to a settings file and share it among your teammates. ReSharper C++ also lets you define other parts of a team coding standard, such as the order of modifiers and the preferred value for pointer initializers. For example, you can specify 0, nullptr or NULL as the preferred initializer style, and ReSharper C++ will respect your choice when it generates new initializers for you. 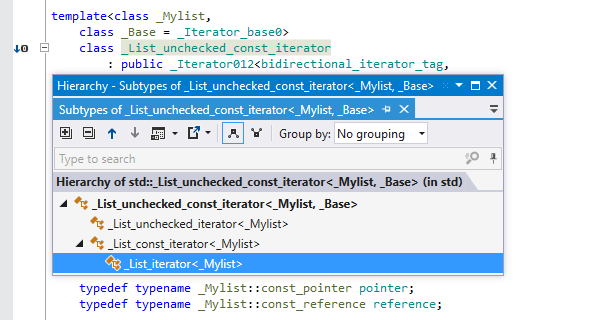 Use ReSharper Options | Code Editing | C++ | Naming Style to select one of the predefined C++ naming styles: STL, Google, LLVM, CamelCase, or Microsoft. Often it's much easier to customize formatting settings by simply detecting them from the existing code. 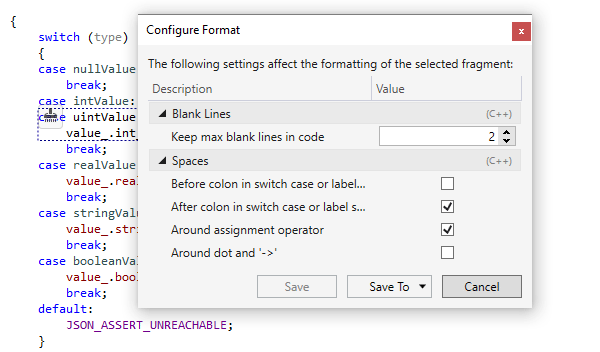 Use ReSharper | Edit | Detect formatting settings menu to have ReSharper detect code formatting settings. You'll get the tool window with the detected values, which can be reviewed and applied to the ReSharper settings on your machine. Or, you can save them to a team-shared settings layer so that other developers on your team will have the same code formatting configuration when opening the current solution. A Visual Studio-integrated unit test runner supports Google Test, Boost.Test and Catch frameworks. ReSharper C++ comes with a unit test runner in Visual Studio that supports Google Test, Boost.Test and Catch frameworks. You can run and debug unit tests, as well as add tests to different sessions, right from the text editor, via the Alt+Enter contextual menu. 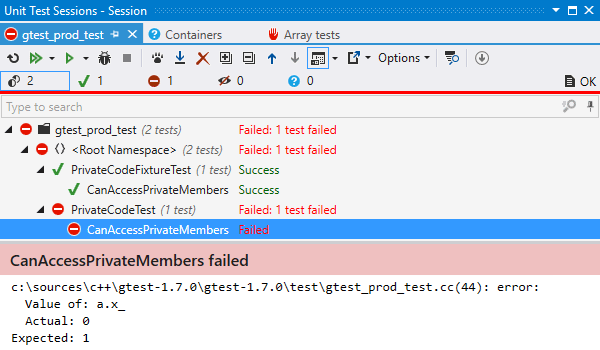 ReSharper C++ provides Unit Test Explorer and Unit Test Sessions tool windows to view, group, filter and run unit tests, as well as to create and manage unit test sessions.